Alan Brown returns in his solo guise as The Great Leap Forward to deliver another healthy dose of incisive political and social commentary, layered on top of his trademark melodic danceable guitar pop music in this expansive 13-track CD and mp3 download “This Is Our Decade Of Living Cheaply And Getting By”. We’re back on familiar ground as the former bIG*fLAME singer responds to the last few years of global and national economic instability in a classic yet tougher The Great Leap Forward style, typically covering a range of musical genres and getting stuck in to those who are certainly not working in the national or global interest but generally for their own interests – all delivered in that familiar and life-affirming fashion that we’ve come to know and care for. Brown continues to provide pertinent observations on life from his side of the street through these rich and diverse songs, from the attacking “Race To The Bottom”, “Capital Is Wonderful” and pop classic “Tax The Richer” to the reflective and poignant “I Catch The Last Bus Home With Driver Of The Flying Scotsman”. Then there’s the songs of hope and optimism, such as “Turning Difficulties Into Goals” and “This Is Our Decade Of Living Cheaply And Getting By Reprise “ – all guaranteed to get the mind thinking and the feet tapping. 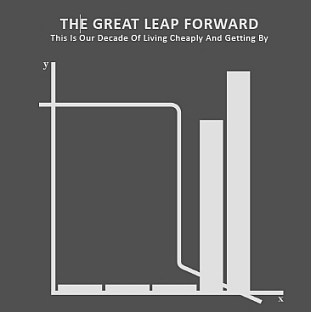 Regardless of whether you’re already familiar with The Great Leap Forward, or you’re discovering this project for the first time, “This Is Our Decade Of Living Cheaply And Getting By” continues Alan Brown’s distinctive appraisal of modern society through the medium of pop music that’s as relevant for today’s pop kids (and their parents and grandparents) as it ever was. “Grown up, refined pop with synth twists and lyrical poetry throughout. Multi-instrumentalist Alan Brown (former member of John Peel favourites Big Flame, A Witness, amongst others) returned to his The Great Leap Forward musical project in 2008 with a scintillating new CD release Finished Unfinished Business. The title of the CD tells the story of the release – all eleven songs featured were at incomplete “work in progress ” stage when Brown decided to put The Great Leap Forward on hold in the early 1990’s to pursue other interests. Returning to update and complete those songs more than a decade and a half later, Finished Unfinished Business features a confident and assured Brown delivering trademark melodic and danceable guitar-driven tunes with those familiar social commentaries and politically overt lyrics – the quintessential mix that received such critical acclaim the first time around. From the countering of the demonisation of young people in the pop opener Tolerance and Respect , through the support for land reform in developing countries in the rolling Wholesome Ways To Change The World and the only song yet known to be written in support of the ethical policies of the Co-operative Bank in the driving It’s Our Business To Say NO to the reflective home area vignette of the pumping The Happiest People Under The Sun (Part 1) – Alan Brown wears his social conscience on his wide-ranging musical sleeve as only he can. Regardless of whether you’re already familiar with The Great Leap Forward, or you’re discovering the band for the first time, Finished Unfinished Business sees the return of a distinctive appraisal of modern society through the medium of pop music that’s as relevant for today’s pop kids (and their parents) as it ever was. You can listen to excerpts from some of the songs here and buy the CD and/or MP3 downloads here. Enjoy. For other releases, go to the Discography page. Alan Brown also plays bass in short and spiky indie popsters Sarandon, who you can find out more about here.